Feng Shui plants for the interior can be generally divided into two types, one type is used to hasten good luck and the other is used to fight against bad luck. In both cases use local species rather than imported ones and for this reason it is better to talk to your local nursery, than to try to import some exotic Chinese varieties. To hasten good luck, the leaves of the plant should be relatively thick and round rather than thin and pointed, flowering plants are more desirable than non-flowering ones, especially if they have light pink, purple and red flowers (Wood generates Fire); try to avoid white flowers which are often associated with death and funeral . Also evergreens are more desirable than deciduous ones for the in-door situation. To fight against bad luck the same requirements applied but it also should have some thorns or pointed leaves like the cactus or the “iron tree”. Having white flowers in this case is acceptable since white is Metal and Metal can cut off bad luck. Bonsai trees can also do the same job as trees in miniature size are still tress and they symbolize shelter and protection. In both cases, try to select an odd number of plants instead of even numbers, so 1 or 3 is more desirable than 2 or 4 plants or pots of plants. Also plants used to fight bad luck should only be used during times when one feels unlucky, most other times, plants used to hasten good luck are more desirable. 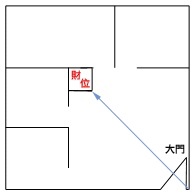 Locate both types of plants in the “ju qi” or the so called “wealth corner”, which is normally diagonally opposite the entry door (see sketch below). Try not to locate the plant too deep into the room or in a dark corner, also in the way of traffic flow or too close to a fire place for the obvious reasons. If one is to have plants indoor, then they need to be kept in good condition and need to be watered regularly to avoid looking dead and dying. A dry and unkempt plant is considered unlucky in Feng Shui. One needs to be aware that we take advantage of the Feng Shui plants not only on a physical level but in a psychological and symbolic sense as well, hence the special requirements in the selection and location of plants. The plants don’t directly hasten the good and fight the bad for you, they are symbols and visual remainders of your needs, fears and longings and it is your eventual decisions and actions that will make the difference. "Juqi" corner showed in red. So then bad luck is always Wood or Earth type? If the bad luck represents Fire, it will melt the white flower’s Metal. If the bad luck manifests as Water, it will wash out/dissolve that Metal. May be “cut off” is not a good term to use, since Metal as a Wuxing Qi in this instant, is to “reflect back” (being shinny) rather than to “destroy” the bad luck, which can come in any type of Wuxing Qi. The use of a Bagua mirror has a similar connotation, it “transforms” rather than “cut off” the bad luck. Similarly can also be said about the terms “to hasten” and “to fight back” used, it is not meant in a literal sense, it reflects our desire to welcome the good and to avoid or to change the bad. Thanks for bring up such a subtle point for consideration, words used in correlative thinking often need to be make clear and amplified. 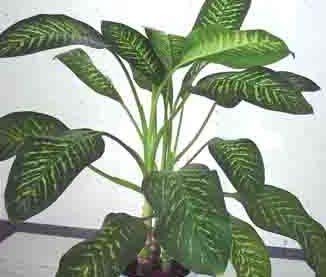 i read your piece on indoor plants and i must say it is the most easy to read article. i have a Q reg plants for the same 2 purposes ( To hasten good luck, and To fight against bad luck ) but i want to keep them on my widowsill. so does that mean they are out door plants and if so , do the plants change ? Put them on the window sill will mean they are on the outside of the house and that would be considered outdoor plants, but they would still have some influence indoor because they are easily visible from the inside. Another idea I mentioned in the article is to locate the plants in the “juqi” corner and that would mean indoor against a wall. When the plants are located on the window sill, the qi is not well assembled as the plants are in the junction between two space, right on the border line between indoor and outdoor. My daughters front door faces west and have two spiky long leaf plant on both sides of the front door. Is it bad or good to have spiky plants near the front of the door? I cannot read the qi of the situation without being there, or at least looking at a picture, to make any meaningful comments. For example, how spiky are the spiky plants? How far are they apart? What is next to them? I have no idea. Thank you very much for sending a reply to my question. The plant leaf is about almost 1/2 inches wide and about 30 inches long and it narrows at the end making it spiky. The distance between the plants is nearly 5 feet. The distance between the leaves is about 30 inches. There are two large trees on the left which has been cut to make it square. The distance between the spiky plant and the front door is about 6 feet. There are two columns behind both plants which extends to the roof. In front of the plants is a lawn. I am unable to send a picture as there is no facility available on this reply page. I hope above description is good enough for you to take a mental picture about the plant.